Diclofenac is a non-steroidal anti-inflammatory drug used to treat pain and reduce inflammation in humans and animals, which is implicated in the dramatic decline in scavenger species in some parts of the world. A traditional method of livestock carcass disposal on the Indian subcontinent and parts of Africa is to leave carcasses to be consumed by scavengers such as vultures. Several species of vultures now face extinction, with diclofenac residues in the carcasses a probable cause. The drug is banned for veterinary use in several countries, for this reason. The collection of forensic samples from long-dead livestock carcasses and dead vultures is difficult, and the resulting samples likely to be of small quantity and low quality. A new gas chromatography/mass spectrometry (GC/MS) method to detect diclofenac residues in long-lived keratinous matrices has been developed to enable long-term monitoring and conservation work. The method involves immersing samples of hair, nails, and feathers in methanol overnight, drying down the extracts, and extracting derivatives. This derivatising takes place by N,O-Bis(trimethylsilyl)trifluoroacetamide with 1.0% trimethylchlorosilane (BSTFA 1.0% TMCS) and ethyl acetate prior to GC-MS analysis. At first, samples were evaporated to dryness at 40C under a steady stream of nitrogen in a block heater – but this method was slow and inconvenient, and the results lacked uniformity. 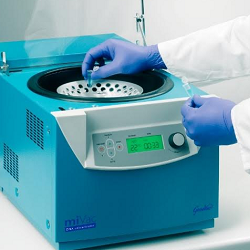 An alternative sample concentration method was developed by researchers at the department of life sciences, Anglia Ruskin University, using a miVac DNA concentrator from Genevac. The researchers report that using the miVac DNA concentrator they were able to dry 44 samples in approximately 15 minutes, a great improvement on the nitrogen blow down system. There were no incidents of partial or incomplete drying, eliminating anomalous results due to poor or incomplete derivatisation. The miVac requires no operator attention or consumables. Genevac says it is capable of safely and efficiently removing water and organic solvents from biological samples in a variety of formats including tubes, microplates, and vials, and is simple to use. It has built-in stored methods, such as for the concentration of water/alcohol based samples, to optimise concentration time. ← Need to automate the extraction of DNA, RNA and proteins?